Amazon's rumored software update for the Fire is here, and like the last one, it breaks root. But it also disables the current easiest way to re-root the device, SuperOneClick. 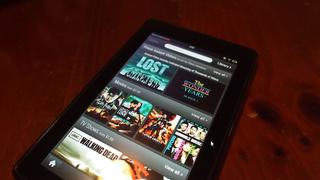 Can a Substantial Kindle Fire Software Update Silence Its Critics? There are two ways to look at this news: as a complete nerd, or as a normal consumer. Let's talk nerd first. This is version 6.2.1, and it's being rolled out as an over-the-air update. Amazon are pushing it out right now, and when your Kindle Fire syncs with the Amazon server, it should download in the background and install. If your Fire is rooted but still running an Amazon-flavored Gingerbread, then it won't be rooted for much longer. More than that, if you rooted using SuperOneClick, the same trick won't work next time — as users are reporting that it no longer works. Currently, if you absolutely need to re-root your Fire, the best option is something like CyanogenMod. But, uh, that is a rather more involved process than rooting using SuperOneClick. There is good news, though. For those who just use their Kindle Fire the way it arrived – so, err, virtually everyone – the update brings plenty of benefits. Aside from the root issues, the update isn't evil — it's actually quite good.